The Senate Open Caucus held a two-hour panel on NAFTA modernization last week with the intention of exploring the benefits and costs of re-working Canada’s most significant trade agreement. 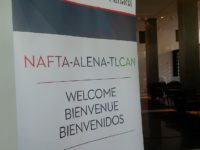 In light of signals that the United States be laying the groundwork to cancel the existing deal, however, the discussion quickly turned to the challenges and opportunities of life after NAFTA. My role on the panel was to focus on NAFTA’s intellectual property and e-commerce implications. My Globe and Mail op-ed notes that to my surprise, the shift in focus to a post-NAFTA world was liberating, opening the door to considering Canadian policies that have previously been viewed as unattainable given intense U.S. pressure on intellectual property policy that favours “Americanization” of global rules. A world without NAFTA would unquestionably be a shock to the economic system, but it would also free the government to establish made-in-Canada IP policies that better reflect domestic values and pursue trade agreements that use international standards as the baseline rather than U.S. demands.